This past Spring, I was in Los Angeles and took an hour to stop and see Mission San Fernando Rey de España, located on the northern edge of L.A.'s San Fernando Valley. Here's a link to Part I and Part II of my visit. 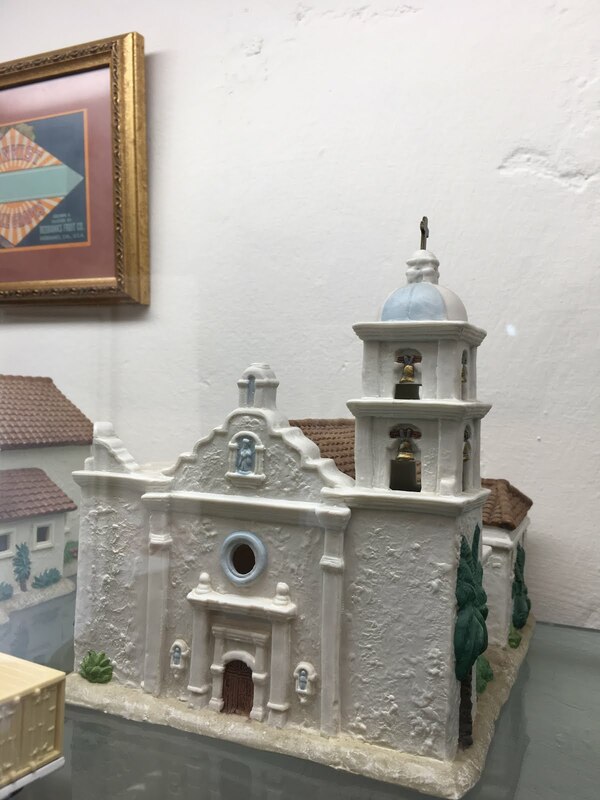 Mission San Fernando is one of 21 Spanish Missions built between 1769 to 1823. Above are paintings of the 21 different Missions, each with it's own architectural style and history. 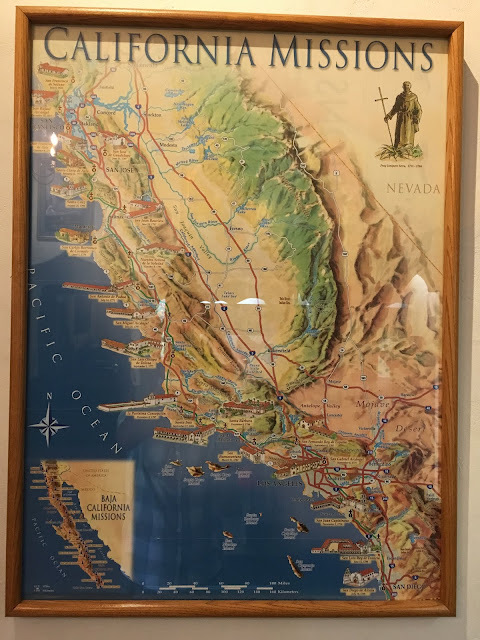 A map of the Missions - stretching from San Diego in the south to Solano, just north of San Francisco. Years ago, the California based department store Mervyn's sold each of the 21 Missions as collector's items. My wife and I (pre-kids) bought a few of them, and then realized we'd quickly run of of places to keep them. Above is a display case with all 21. San Diego de Alcala, 1769. 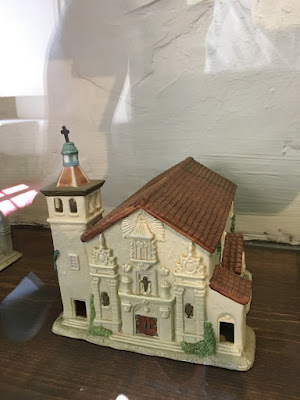 California's first Mission. Mission San Luis Rey, in Oceanside (north of San Diego). Santa Clara de Asis, located on the University of Santa Clara campus, in Santa Clara. 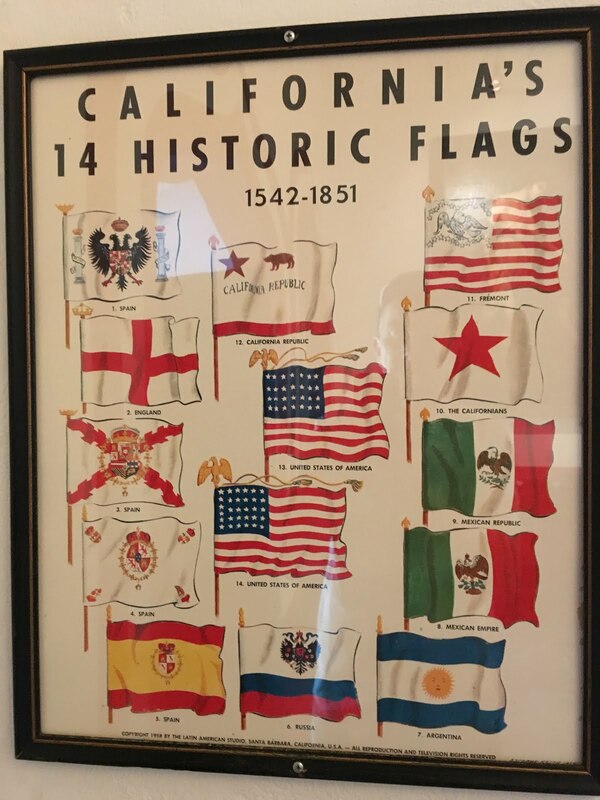 Of equal interest (to me, at least) was information on the various historic flags that have flown over California at one time or another. Obviously, the flags of Spain, Mexico, the independent (and very brief) "California Republic", and the US flags are the best known. 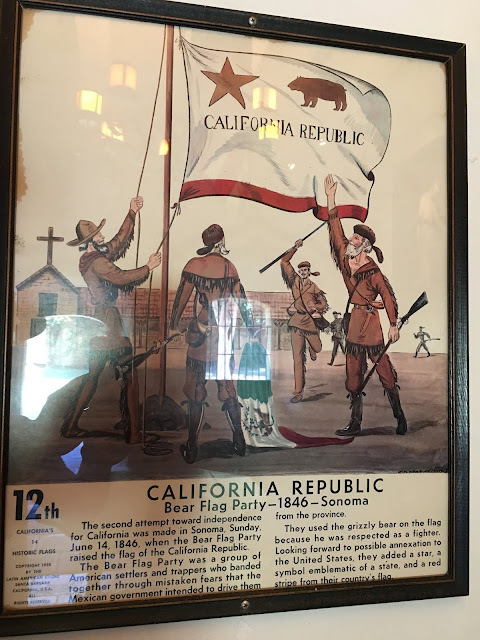 "The second attempt toward independence for California was made in Sonoma, Sunday June 14, 1846, when the Bear Flag Party raised the the flag of the California Republic. The Bear Flag Party was a group of American settlers and trappers who banded together through mistaken fears that the Mexican government intended to drive them from the province. They used the grizzly bear on the flag because he was respected as a fighter. Looking forward to the possible annexation to the United States, they added a start, a symbol emblematic of a state, and a red stripe from their country’s flag." Lesser known is the flag of Argentina. Really? The text reads: "The South American revolt for independence from Spain was felt in California when Hipolito Bouchard raised the flag of Argentina in Monterey, Sunday, November 22, 1818. 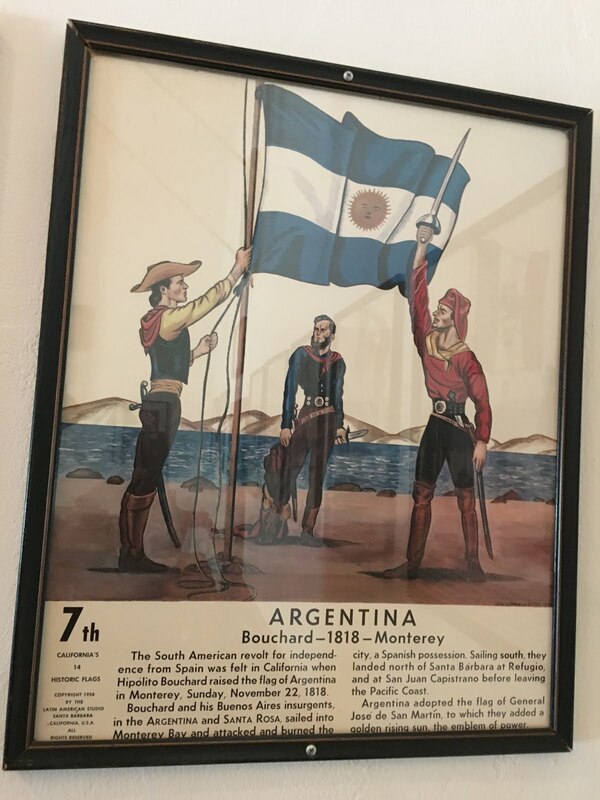 Borchard and his Buenos Aires insurgents, in the ARGENTINA and SANTA ROSE, sailed into Monterey Bay and attacked and burned the city, a Spanish possession. 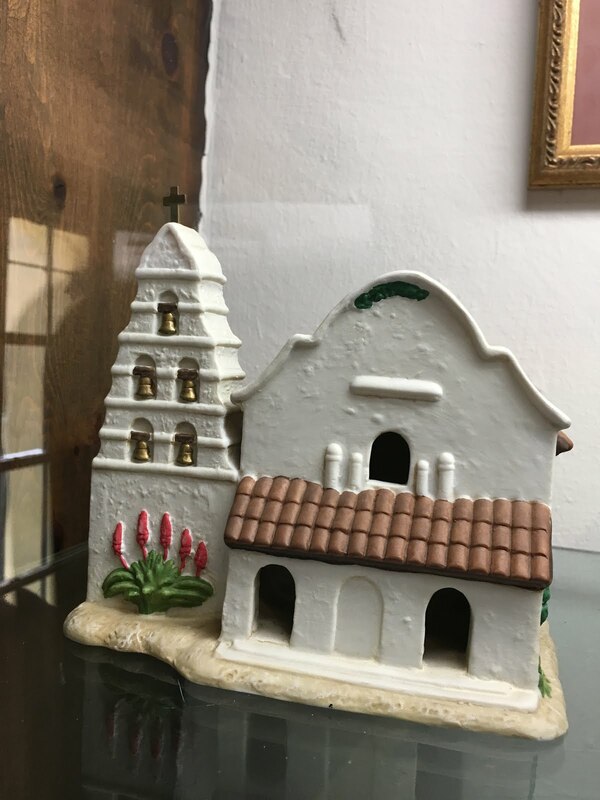 Sailing south, they landed north of Santa Barbara at Refugio, and at San Juan Capistrano before leaving the Pacific Coast. "In the name of Emperor Alexander I of Russia, the flag of the Russian American Company was raised by Ivan Kuskof at Fort Ross, Thursday September 10, 1812. Kurkof sailed from Sitka, Alaksa, to build a fort and establish a Russian colony in California. 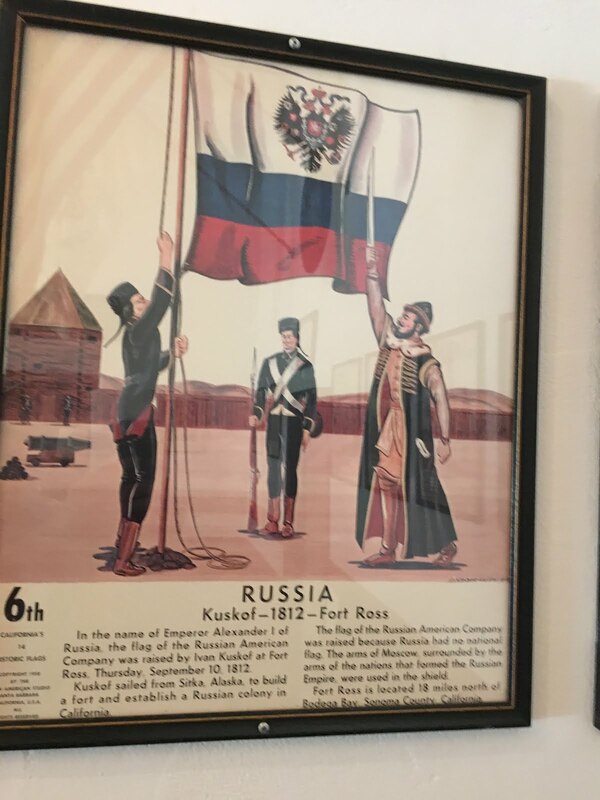 The flag of the Russian American Company was raised because Russia had no national flag. The arms of Moscow, surrounded by the arms of the nations that formed the Russian Empire, were used in the shield. Fort Ross is located 18 miles north of Bodega Bay, Sonoma County, California" - approximately 90 miles north of San Francisco. "The first step towards independence for California was made by Juan Bautista Alvarado. He raise a “one star flag” in Monterey and proclaimed the territory “the free and sovereign State of California” on Sunday, November 6, 1836. 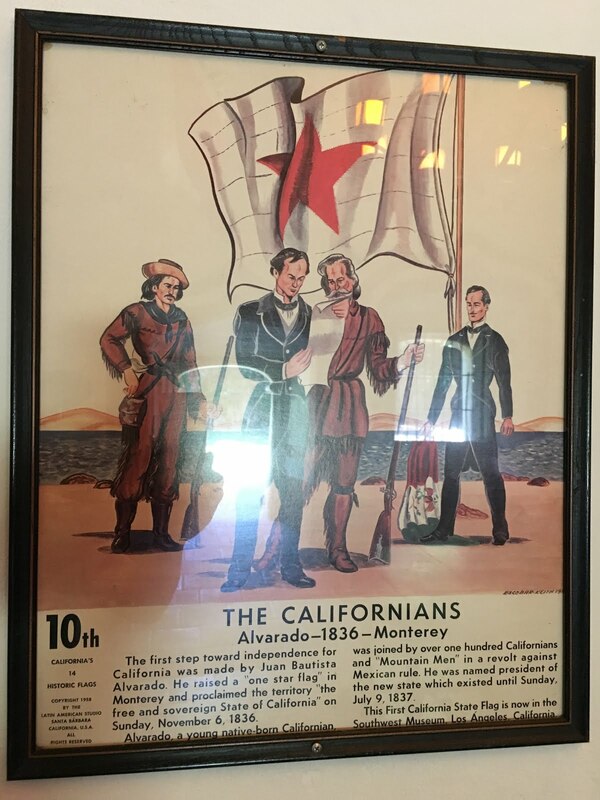 Alvarado, a young native-born Californian was joined by over one hundred Californians and “Mountain Men” in a revolt against Mexican rule. He was named president of the new state which existed until Sunday, July 9, 1837. This First California State Flag is now in the Southwest Museum, Los Angeles, California." Exit through the gift shop: there was a huge selection of religious and religious themed items, from the sacred to what felt a lot more like tchotchkes (Yiddish for trinkets). Back outside in the large quad, and the historic fountain. Not sure how historically accurate the tropical foliage was, but who cares - it was really beautiful. 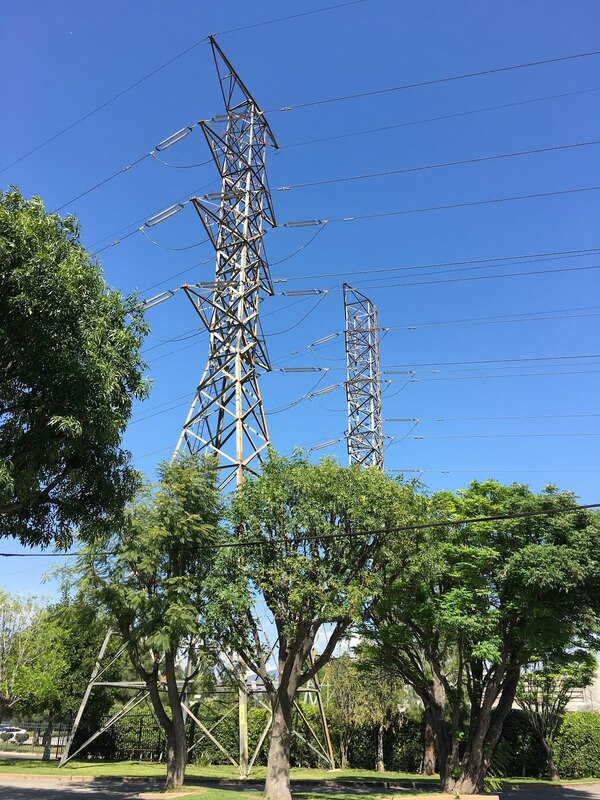 What wasn't too beautiful were the necessary, but ugly, electrical towers along the edge of the property. Another view from the parking lot. These things are huge. This is the view from where I parked. Driving away, this is a final view of the Mission's historic Convento. This was along the street. Continued driving. There was one more place I wanted to visit. I'm embarrassed to say it's been years since I've stopped at my grandparents grave. Their marker was so overgrown, I could barely find it. I asked a maintenance worker if he had some clippers - just so I could cut back the grass. Instead, he came over and used a shovel to clear away the grass. 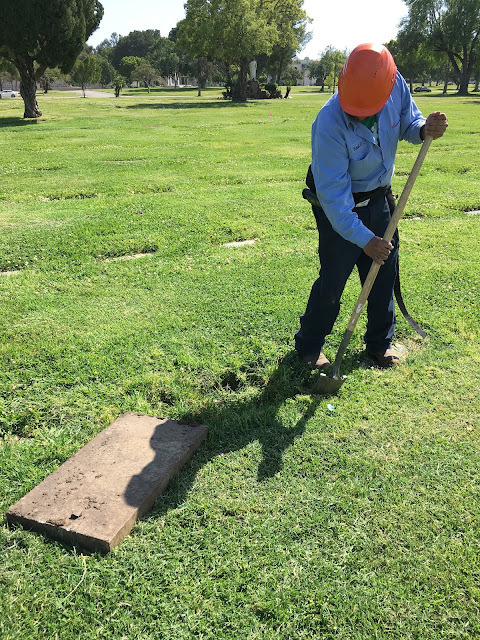 I was suprised that the grave marker isn't really attached to anything - it's simply placed on the ground, and is easily movable. 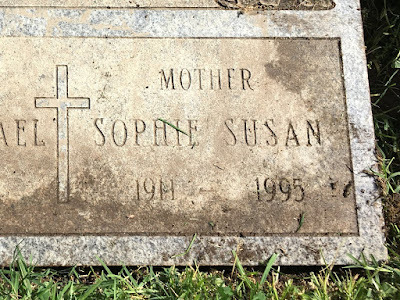 My grandmother and grandfather share a headstone (as this is a public blog, I decided to leave off last names). 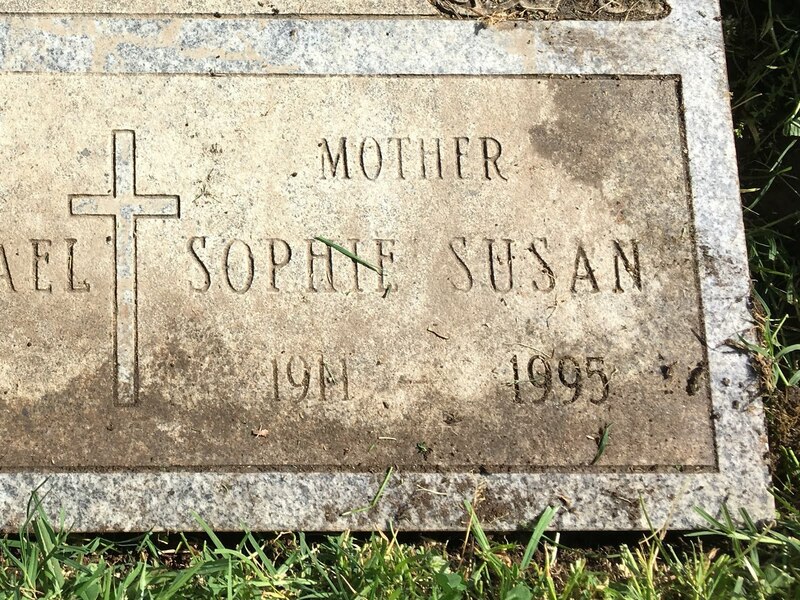 My grandmother Sue (she went by her middle name) lived to be 83. My grandfather Bruno lived to be 75. He really was my "fun" grandfather. I have great memories of him taking me and my sister to the park when we were little, to places like Farmer's Market (at Sixth and Fairfax), and teaching me how to use power tools in his old school wood-shop garage. 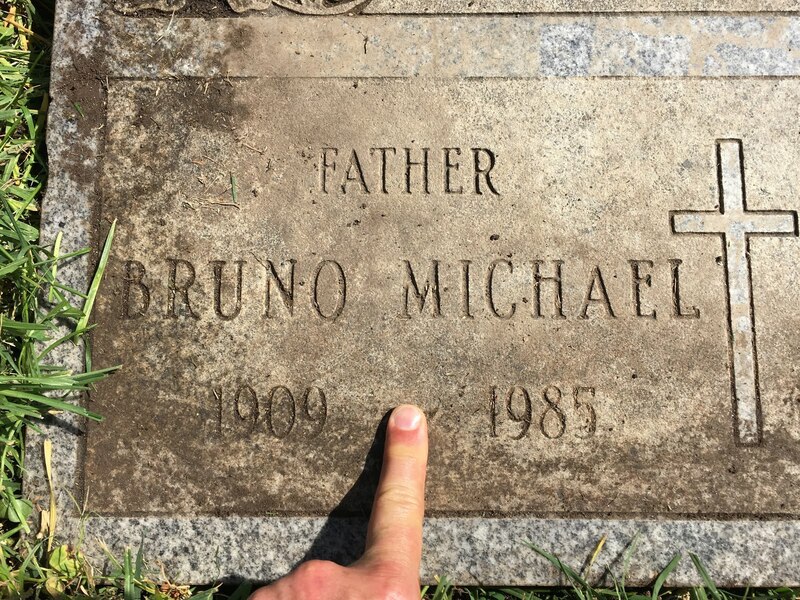 Above, my finger covering the "dash" -- representing his life on earth, and a reminder of the brevity of all our lives on earth. Christians believe that the choices we make here on earth with influence our eternity. How did we use our time? Our God-given talents? And our resources? Most importantly, what did we do with Jesus Christ? Did we embrace him as both Savior and Lord? Or did we see him only as good teacher or only an example to follow? 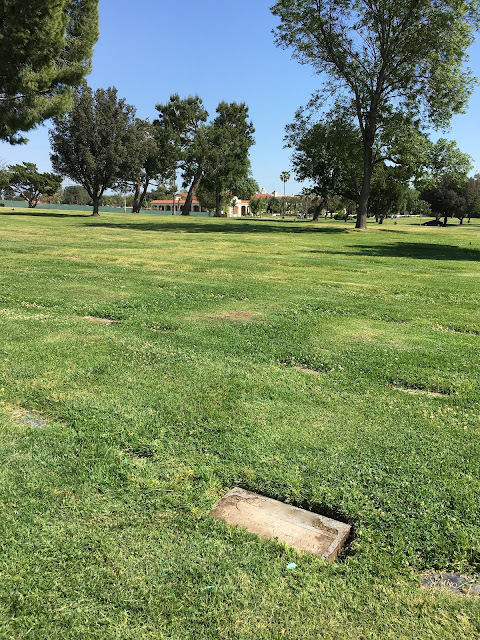 Above, my grandparent's grave marker, with Mission San Fernando in the distance. While perhaps previous generations were obsessed with death, it feels like today we've gone to the other extreme - denying the reality of death, and - more sobering - the reality of eternity. There was a positive side to having cemeteries (verses, say, a parking lot) as part of a local church's property. As I hit the road and headed home, I passed by some beautiful orange groves. The first citrus trees were planted by Spanish missionaries in the late 1700's. Today, only Florida produces more citrus. And in terms of oranges for eating (rather than for juice), California is #1. 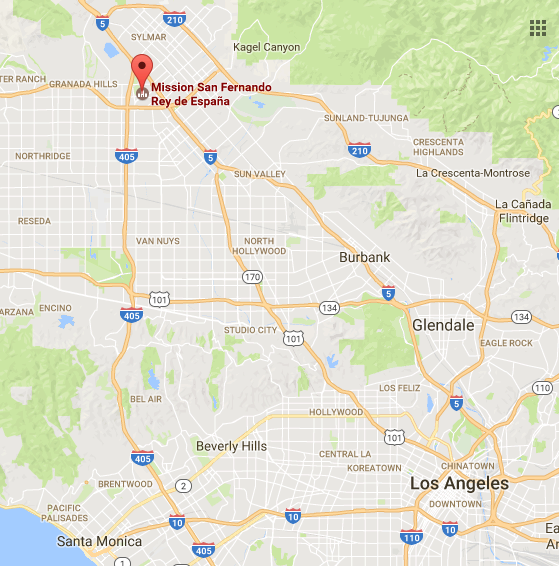 Here's a map showing the location of Mission San Fernando. Amazingly, they don't have a website (seriously?) but the Mission is featured on numerous websites, including here.